Whenever I reboot or turn my iBook back on from being off, the search engine on TenFourFox is always Yahoo (which I change back every time to Google). I don't know why exactly this is happening, and I am not sure if it is either something from the actual browser or if it is related to my OS. Hi their I use my machine everyday and try to help out here and may have found the solution as it was defaulting to Yahoo for me I use yahoo as my default and never came across this glitch sol I just replicated everything and may have found a solution it worked for me on 10.4.11. 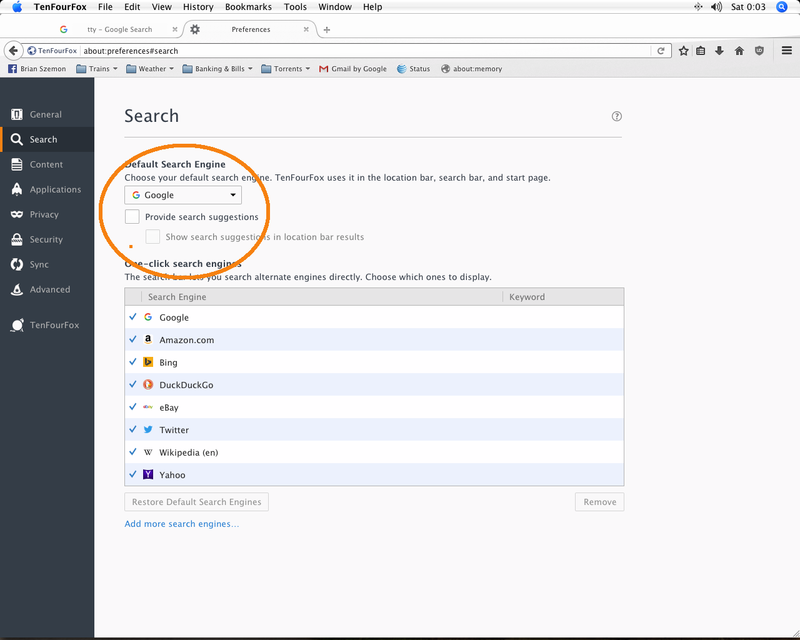 7. open new tab close out preferences tab and try a search in the address bar. 8. if search pulled up google close browser restart and google should still be default. I worked on this for about an hour changing things in about:config before simply trying the way I found that worked. I do plan on making a YouTube video of how I did it but at last it's 0040 here and I need some rest tomorrow is another day. Try the above if it works let me know if doesn't then maybe it's a combination of this and setting i played with in about:config and I'll post them but I'm sure it's not. I just tried this and Google seems to remain the default search engine. So far it's working great! Thanks Brian! You are very welcome Mr. Scott Novak I'm glad with a little work I could find a fix. Cameron Kaiser and Chris (chtrusch) maybe we can make my fix a sticky or something to help others. I'm not a coder but maybe their is a way to take my fix and tweak some code inside the program, But this is beyond me. Your suggestion is certainly a good workaround but I'd like to better understand what went wrong. Before anyone tries this, please look at comments 26-28 and see if Brian's steps change the files mentioned in those comments. Hard to tell if my test of this workaround makes sense because here in Europe, Google is the default search engine anyway, while in the US it's Yahoo. search-metadata.json still doesn't exist in a fresh profile and isn't created by any of the actions taken as described in the workaround. After taking the steps described in the workaround, "Google Default" seemed to stick as the default search engine. However, after I had I applied my own STR, at the next restart "Google Default" had vanished and "Google", which I had previously deleted, was set as the default engine again. Also note that I rechecked "Provide search suggestions" and Google still remains as my search engine when I restart Tenfourfox. For now all is well. I created a new profile and found the same behavior that the others report: The default search engine reverts to Yahoo once TenFourFox is restarted. My old profile is able to retain Google as a default search engine except for the occasional appearance of a random search engine that I reported earlier. However, upon quitting TenFourFox the defaultenginename line appeared in prefs.js. There was still no search-metadata.json. I had not made any actual searches before quitting. With the next start of TenFourFox the default search engine reverted to Yahoo, but the defaultenginename line with Google remained in prefs.js. But then I did a search with the default engine (Yahoo), and the defaultenginename line disappeared from prefs.js. The line did not come back after quitting. After several rounds of restoring defaultenginename with Google to prefs.js and doing a search it became clear that executing a search removes the defaultenginename line from prefs.js. Next, I copied search-metadata.json from my old profile to my new profile and started TenFourFox with the new profile. The defaultenginename line was absent from prefs.js. This time Google was the default engine at start-up. And, defaultenginename with Google had been restored to prefs.js. What's more, executing a search did not remove defaultenginename from prefs.js. After another restart of TenFourFox with my new profile Google remained as the default search engine. However, as I wrote in my previous message, Google continues to prompt with instructions to set Google as the default search engine even though it is the default search engine. As a final test I removed search-metadata.json from my new profile and started TenFourFox again. Sure enough, the default search engine reverted to Yahoo. All that text was on one line. E-mail clients will undoubtedly mess it up. Having trouble reading this? View this discussion online: Automatically changes default search engine after reboot. Terrence, that is very helpful. To others experiencing the problem, if you recreate the file from an old profile, does that fix it for you also? If so, I think I have a good guess what went wrong now. I cannot confirm this, sadly. I can still reproduce the bug using my STR when an old search-metadata.json is present in a new profile. The file doesn't even get touched when I change the engine. What is touched, however, is search.json.mozlz4, as soon as I switch the engine. It's also the last thing in the profile that's written to in the startup sequence if the engine has been changed during the last session. If I change the engine, then quit TFF, then duplicate this file and rename the duplicate search.json.mozlz4.tmp (else TFF would create the temp file if it sees that it cannot write to search.json.mozlz4 at startup), then *lock* both of these files, then start TFF, the changed search engine sticks even when I use my STR repeatedly. Therefore the engine must be saved in search.json.mozlz4 and be overwritten somehow at startup with the default engine. Did not work for me ether, Although Chris's fix dose work so everything would seem to point at that "search.json.mozlz4" file being overwritten somehow after restart. The LZ4 connection does make sense: we already know that the LZ4 module doesn't work properly on PowerPC for some reason (bookmark backups, for example). I made a speculative fix to the beta version of 45.9 that goes with that theory (that LZ4 is responsible). Chris can no longer replicate this problem with this build. I'd appreciate others testing it, since none of our local test systems show the issue and I have no other way of verifying this is actually the problem. default search engine. So, the problem really seems to be fixed. explain the fix to Google :). We're still having this problem in 45.9 but it only started happening recently. Did anyone come up with a comprehensive way to fix this? BTW I'm trying to set the default to DuckDuckGo which doesn't have a "Default" engine like Google does. strayed since I installed Cameron's fix. old profile may be corrupt. Nothing makes search settings save; every time I close TFF and re-open, it's back to Yahoo Search. This occurs even when I delete all search engines from the "One-click search engines" list and add in "Google (Default)" as the sole search engine. Something is making this browser restore the default list of One-click search engines every time it launches. If there's a workaround or a file I can make read-only to force the settings to save, please let me know; otherwise, I think this issue just needs to be investigated further. Just a reminder for people: as the release notes for 45.9 said, where the speculative fix was first deployed, you may need to start with a clean profile for the setting to stick -- for some users their profile was not able to be automatically fixed and we don't know why. You can try creating a clean profile with the profile manager and seeing if that works (see the FAQ for instructions). If it does, export your bookmarks and any necessary settings and add-ons and load them into the new profile. If it doesn't, please note that here, though I don't have other suggestions right now and I've still never been able to replicate it on the test systems. I installed 45.9.0 and I was able to set Google as my search engine without any problems. I haven't had any problems. How ironic that my AirPort WiFi card went kaput before the patch for the bug was released. Glad I reported the bug though, and glad it's working (at least to my understanding). Thanks to all for working these threads on the search pref. Just rolled to 45.9.0 (G5/quad, 10.5.8) with existing profile and all is well. I am having this problem again in FPR 4. TenFourFox defaults to Yahoo every time it is restarted, in spite of having the Default Search Engine add-on installed and set to Google, and in spite of having google set as my default search engine in Preferences! Michael, I think you're seeing a different problem. What we had originally was the browser changing the default engine by itself (i.e. no related add-ons installed), and this problem has been fixed. I cannot replicate the old bug with FPR4.1 using the STR I posted in this thread. Please try uninstalling the add-on you're using and then set up the default engine again. If this doesn't work you may have to resort to what's described in comment #50. I'm using the latest version of TFF, FPR6 (SPR1). On Max OS X 10.4.11 on a powerbook G3 in the United States. This just happened to me, it reverts to yahoo after tenfourfox is opened. I replicated it twice. Joey, the only thing in this case I can do is refer you to comment #50 in this thread.